I was at the Singapore Day Festival on Monday afternoon and got hold of this flier a local anti-art group called Horizontal Helicopter was giving out. After seeing this flier, I was enraged and approached one of group members to clarify their motive. He said it was just “anti-art” and the message was not meant to tell people to really kill pretentious art groups. I told him artist abuse is very real in Singapore and they should not even promote something like this – be it anti-art or be it a joke – as there will be sick people who may take this at face value and carry out this act in the name of “anti-art”. Can I please ask that you investigate this wrong act and ensure this amateur “anti-art” group does not create any form of media of this nature in future? 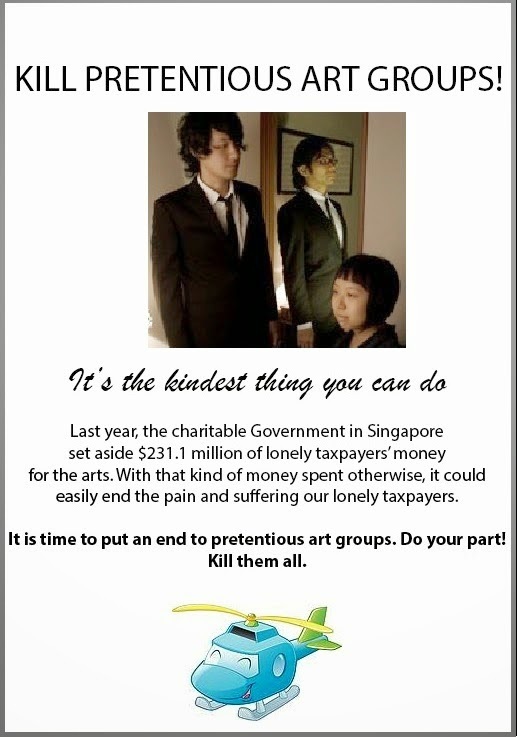 SPCANA has just been alerted to this “Kill pretentious art groups!” flier. We urge all members of the public to disregard the aforementioned notice’s instructions. Under the Pretentious Artists Act, any form of cruelty to artists will render the offender liable to sentence of watching Arts On Okto every night for up to one year, a monetary fine of up to $10,000 or both. We ask that the group responsible for this notice be mindful of how innovative art groups – a more apt term for “pretentious art groups” – are an integral part of our society ultimately. We thank Voices For Artists for alerting us to this notice. This flier was one of a series of fliers conveying intentionally distressing and morally questionable messages, such as killing pretentious art groups, lying to your loved ones, and committing adultery. As part of the exhibition at the Singapore Day Festival, the fliers and other exhibits explore the theme of pretentious art and other acts of evil. Satirical didactics were used throughout the show with the intention to provoke reflection within the arch of the exhibition. We do not advocate or condone the killing of pretentious art groups. On the contrary, we are pleased that the issue of pretentious art is highlighted. SPCANA is putting this issue to rest, having heard from the relevant parties and understood the context. We urge all to keep calm, even as we remind all of the importance of upholding artist welfare. For the record, we would like to clarify the following. We are concerned about the messaging created by the four words, “Kill pretentious art groups!” and how it could be interpreted. Not everyone can understand how the reverse psychology, used in the performance, is supposed to work. Many will still take the phrase “Kill pretentious art groups!” at face value. 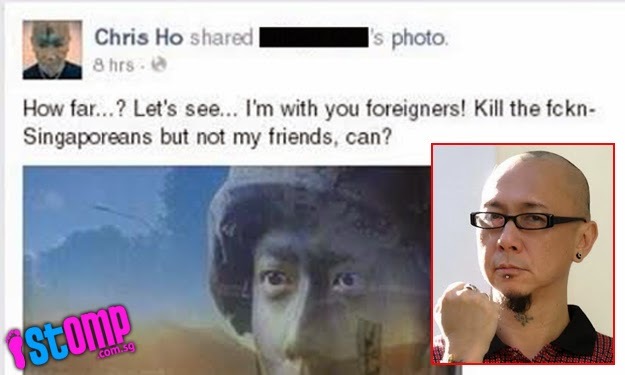 Remember pretentious artist wannabe Chris Ho’s recent “Kill Singaporeans” comment on Facebook, which he also said was satirical? That didn’t go over very well too. Looking at the ever-increasing number and severity of artist abuse cases rampant in Singapore today, we hope the organisers and group concerned can empathise with how we (SPCANA) – as well as many members of the public – are disturbed by how the message could be misconstrued. 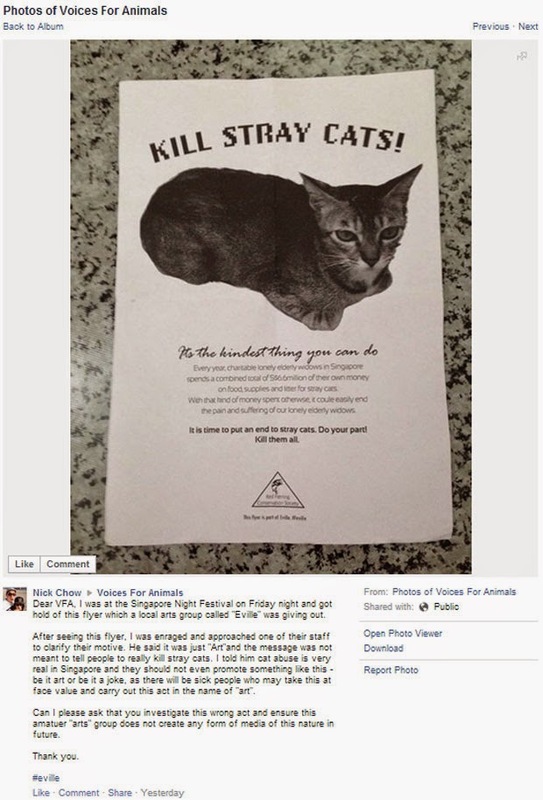 Just last week, art group Vertical Submarine was subjected to online abuse for distributing fliers with the message “Kill stray cats”. 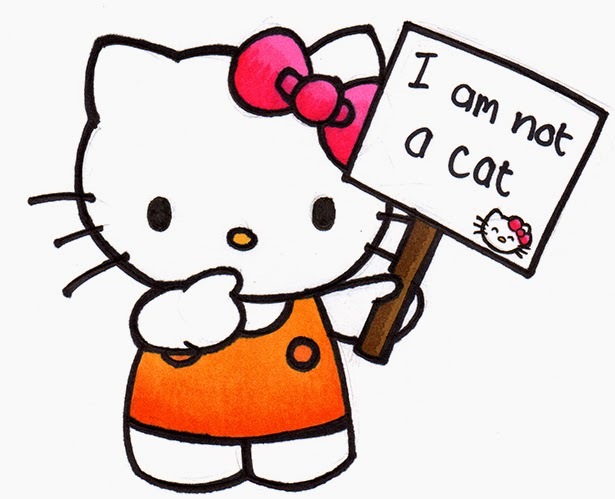 No wonder Hello Kitty didn’t want to be a cat any more. We thank Horizontal Helicopter for their clarification on their Facebook page and in their private messages to us explaining their stand and rationale. You might have heard of the growing controversy over the Singapore Day Festival exhibition after objections were made on social media to the “Kill pretentious art groups” flier in particular. What you might not know is that the exhibition was supported by the Singapore Killjoy Movement. The exhibition was about the pretentious art that can exist in our society like “Kill stray cats” fliers. The intention was to ask of participants their own stand on pretentious art, whether they would participate in or reject these notions, through the use of satire and horror. We wish to assure concerned individuals who were exposed to the edited versions of the flier circulating on social media that neither we, nor Horizontal Helicopter, in any way condone violence towards artists, or any of the other topics that were touched on during the exhibition. If you have any other concerns or comments, please do write to us at killjoy@killjoy.sg.